Today Kellian and I headed to Japan for a bit of vacation as well as the International Puzzle Party! We decided to splurge a little bit and get the direct flight from Boston to Tokyo, which was awesome. First off, it took 13 hours rather than 22+, which is great. It was also on the new Boeing Dreamliner which has all sorts of fancy new features: variable tint windows, usb charging plugs everywhere, AC charging plugs under each seat, and an excellent in-flight entertainment system. Kellian and I passed the time watching a few movies and playing some of the games (Street Fighter!) on this system, we didn't even need to break out the iPad for entertainment. Once we got to Tokyo at around 4:00PM, we made our way to our hotel. This involved taking a train and then taking a cab, which should have been pretty simple. Unfortunately, we had a heck of a time getting an ATM to give us some cash for the cab: we tried about 5 of them over the course of an hour without any luck. Eventually, we just started asking around if there was some place we could convert some USD into Yen, and there was actually one nearby. That was a relief! We found out from a German fellow living in Japan that there was recently a change to the ATM network that may be what is causing the problems. He pointed us to a particular bank (Postal Bank) that should accept our cards, so we're planning to try that tomorrow. Once we got a cab, he had a bit of trouble actually finding our hotel (The Edo Sakura), but eventually we got there! It is a new ryokan (traditional Japanese inn) with futons and tatami mats the rooms. Pretty neat and very clean since it was recently constructed. After that, we headed out to grab some dinner, which was unfortunately just as the rain started coming down. We made a run for it and ended up finding a place, but not before we were pretty wet. 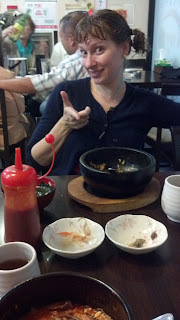 Due to the rain, we couldn't be very picky and actually ended up at a Korean restaurant. Still, it was delicious! Now Kellian is snoozing and I am finishing this blog up rapidly so I can do the same. No sleep for quite a few hours (I didn't sleep on the plane), so I'm looking forward to getting some rest! You keep the best travel blogs -- will be following this one closely so keep the updates coming. And glad you enjoyed the 787! Yey!!! Glad you guys made it safely! That Korean food looks pretty good! Can't wait to read more! Thanks everybody! Glad you are enjoying it! Thanks for once again letting those of us stuck in the US share your adventures vicariously.